For graduate and undergraduate courses in marketing management. 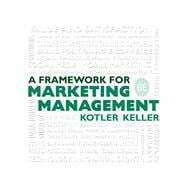 Framework for Marketing Management is a concise, streamlined version of Kotler and Keller’s fifteenth edition of Marketing Management , a comprehensive look at marketing strategy. The book’s efficient coverage of current marketing management practices makes for a short yet thorough text that provides the perfect supplement for incorporated simulations, projects, and cases.